Dave Scott Blog Why Can’t Folks East of The Mississippi River Fix Brisket The Way Pit Masters In Texas Do? Why Can’t Folks East of The Mississippi River Fix Brisket The Way Pit Masters In Texas Do? Despite the infinite number of barbeque joints that pepper the rural deep south, I’ve never discovered any that fix beef brisket the way the folks in Texas do it. For reasons that I’ve never understood, folks in Dixie rarely lay a slab of beef on a grill unless it’s a steak on their Weber at home. Wander into any BBQ joint in Georgia, Florida, Alabama, etc. and ask for brisket and the waitresses and customers will point at you and laugh and the pit master will holler ugly things about your mother until you leave. The moist, aromatic, tender slabs of perfectly smoked brisket perfected by Texans, is not as appealing to the deep south palate as pork, a staple of most BBQ joints found in rural areas with names like Ducktown in Georgia or Sopchoppy in Florida. Maybe it’s because Texas is chock-a-block full of cows and Florida and other deep south states are waist deep in pigs. Just as those in the deep south know how to cook up a pig, Texans know what to do with a cow better than any other people on the planet. 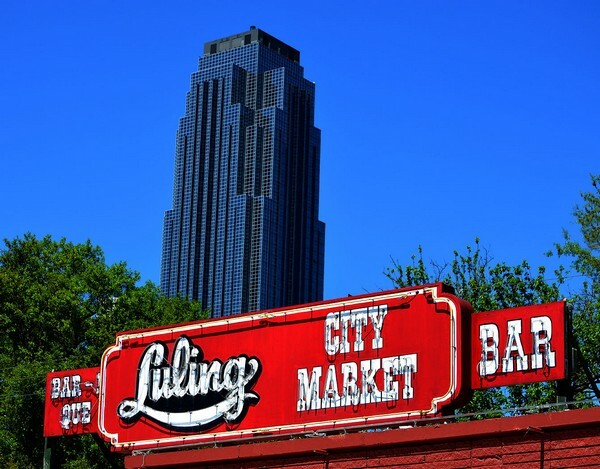 One of the best beef briskets I’ve ever eaten was at Houston’s Lulling City Market, a close to 40-year-old ramshackle joint sitting in the shadows of Houston’s Greenway Plaza skyscrapers that attracts oil traders, truckers, and bankers that dine on heaping piles of brisket weighed and sold by the pound at the end of the serving line and handed over on butcher paper. Sides of thick slices of raw onions, Texas-style pinto beans and whole jalapeno peppers make for a balanced meal at the Lulling City Market. Even though I never saw him there, I’ve been told by the owner, and Market regulars that former President George H.W. Bush used to stand patiently in line with the rest of the folks to place his brisket order. The closest I’ve found to authentic brisket east of the Mississippi River was the Texas State Line, a shack sitting in the corner of a parking lot near the intersection of Peachtree and Piedmont roads in the Buckhead section of Atlanta. The guy that ran that place had a juke box that played “Waltz Across Texas” by Ernest Tubb and beer iced down in huge troughs, Texas ice-house style. BBQ brisket, Ernest Tubb and ice-cold long necks, it doesn’t get better than that. There was also a place in Coupland, Texas about 40 miles northeast of Austin that didn’t have a name as I recall, but it didn’t matter because from what I remember from the early 1980s, Coupland consisted of an old hotel next to an abandoned railroad siding and not much else. The place was home to a mouth-watering BBQ joint, cold beer, and hotel rooms that were used to store old pinball machines that were for sale. The BBQ brisket was well worth the 80-mile roundtrip drive. 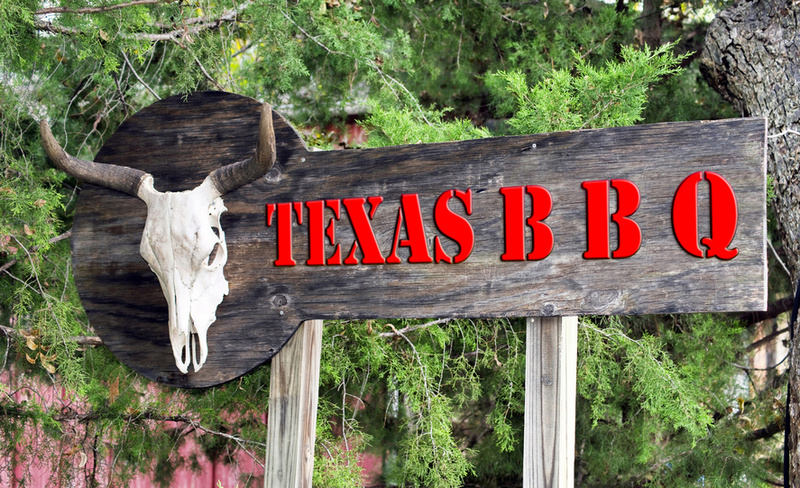 “Texas Monthly” magazine publishes an annual list of the 50 best barbeque restaurants in the world, and year-after-year they all happen to be in Texas. Imagine that. 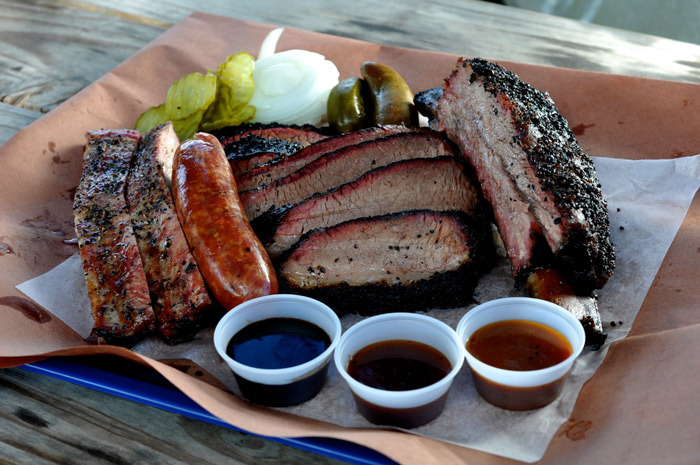 Texas style brisket, smoked links, raw onions, jalapenos and sauce, served on butcher paper. Over a few beers one evening a few years back, John Kelso, a newspaper columnist in Austin, told me that the definition of a Yankee was “someone who thinks 100 miles is too far drive for good barbeque.” Well, call me whatever you want, and as much as I love BBQ brisket I’m never going back to Atlanta, not even for great BBQ at the Texas State Line, if it still exists. I escaped that Georgia hellhole close to seven years ago and to paraphrase a country-western song: “Happiness is Atlanta in My Rearview Mirror.” I’ve driven the 1,000 miles to eat at the Lulling City Market – and to visit our Houston-based son, Eric, and his family while there — but I don’t ever anticipate going back to Atlanta (City Motto: If You’re Lucky You’ll Only Get Shot) a city that makes crime and traffic in Jacksonville (City Motto: You’ll Definitely Get Shot) look like a kindergarten kerfuffle. But we’re talking about BBQ brisket here. The other day I sat at the bar in Willie Jewell’s in Yulee at the intersection of State Road 200 and Highway 17 and ordered the beef brisket, sides of cole slaw, beans and a cold beer. I didn’t hear Ernest Tubb, wasn’t offered jalapenos or raw onions, but I did taste one of the best pieces of brisket I’ve found in these parts — tender, moist and fragrant, with bottles of tasty spicy red Texas-style BBQ sauce within easy reach. What is it about brisket above all other barbecued meats? Is it the flavor, its blackened exterior, the fat rivulets, the tenderness, or the terrific smell? It’s all of those things, combined with a pit master who knows his way around a smoker. The pit master is key. Those preparing the Scared Brisket must possess mental discipline, concentrating on tending the fire and minding the meat, consuming vast quantities of beer along the way, exhibiting discipline by not wandering off to watch a game, or sneaking off to see a girlfriend or constantly checking Facebook and email or sending text messages unless it involves the task at hand. For the past several years the Island BBQ attached to the backside of Hammerhead on Fletcher has sat empty and its pit ice cold. A talented guy named Rodney manned the pit when I first arrived on the island and he produced some tasty barbeque, but he disappeared years ago and the site awaits a new artist who understands what it takes to draw a crowd. I think locals Lowell Hall and George Sheffield co-own that building so if anybody has a clue those are the guys to contact. Despite not having a fire pit, Paul Hinch, the owner of the Yulee and Kingsland, Georgia Willie Jewell’s, tells me that his brisket is put in an electric oven at 8 p.m. in the evening and stays there until 8 a.m. the next day. An electric oven? A true Texan brisket aficionado would scoff at an electric oven-cooked brisket, but this amateur palate thought it was darn good — moist, tender and tasty and I’ll be going back often for more since the 2,000 mile round trip to Texas isn’t practical and Eric and his family recently moved to pork chop country in Asheville, NC anyway. Call Willie Jewell’s in Yulee at 904/ 849-1298. Legendary Locals: Fernandina Beach High School guidance counselor and author Rob Hicks tells us that his latest book, “Legendary Locals,” which is about exactly what its title says, will be available in stores on June 5th and that there will be an official launch party at the Centre Street Book Loft downtown on June 6th from 5-8 pm. 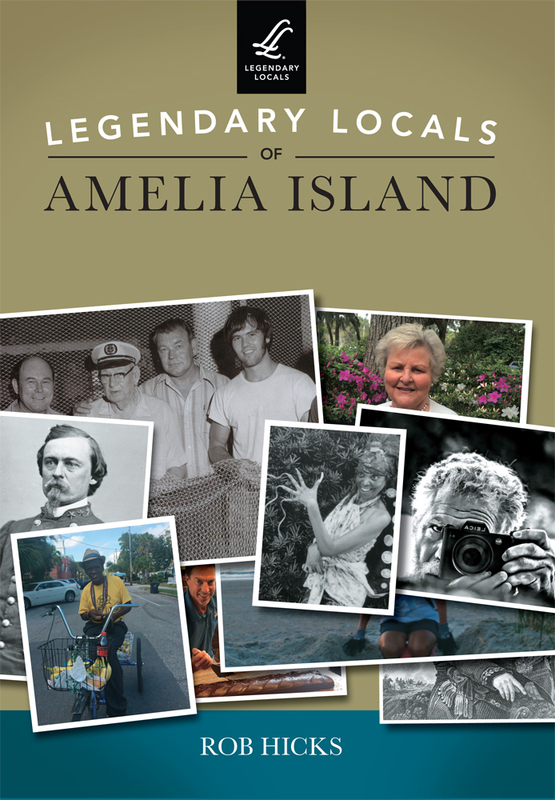 I’ve heard that I’m in the book and I’m flattered, since “legend” is not a term many hereabouts use to describe me. Others that made the cut include tricycle peddling peanut vendor, Felix Jones; boat captain, bar owner and shop keeper, Pajamadave Voorhees; Mike Bowling, the creator of the Pound Puppies, and many more living and deceased locals that folks will recognize and have fun debating. I have no idea if the book has these “legends” categorized e.g. “Scoundrels” – where David Yulee should be listed; “Characters” – where Pajamadave might fall, and “What the hell was the author thinking?” – where I might qualify, but it will be an interesting read. Random Thoughts: Why are gay people called “gay.” I’ve never heard a reason for that and I guess I’ve never asked before. I dated a girl in high school named “Gay” who wasn’t, but I’ve never met another gal by that name, ever. 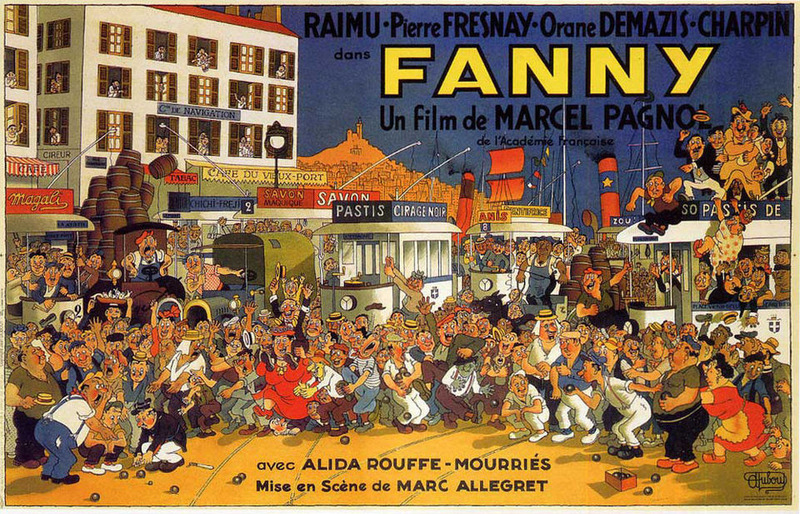 Along Came A Man With A Big Cigar Who said “Come Here Boy, I’ll Make You A Star” Department: Tomorrow morning, Saturday, May 13, the Amelia Island Tourist Office will create a video, to replicate a short but famous scene from a French 1932 movie “Fanny”, shot in Marseille. The film features the famous scene (famous in France anyway) where a city trolley comes to a standstill as two passionate petanque players compete on the tracks in front of it. Belgium-born expatriate Philippe Boets, founder of the Amelia Island Petanque Club is inviting anyone who wants to be in the movie to be part of the crowd scene and action. He said they won’t be using the local railroad tracks and a train won’t be involved but instead an Amelia Island Trolley, in the parking lot south of Atlantic Seafood, just north of the marina petanque courts. Filming begins at 9:30 am and folks are asked not to park in the parking lot so as not to disrupt the film crew, but to use other parking areas and walk to the filming site. Boets said the cast is meeting at the South Street Green Turtle, tonight (Friday, May 12) to rehearse, which should be just as interesting as the next day’s film shoot. School Daze: Where are the school trustees, chancellors, presidents, deans, and law enforcement officials? While university students are running amok, using brute force and criminal violence to silence opinions they don’t like, the folks in charge appear to be cowering under their desks. While Ann Coulter, Heather McDonald, Charles Murray, Milo Yiannopoulos and others have all been threatened, shouted down, sometimes assaulted and forced to cancel speeches that many other students wanted to hear, authority figures are nowhere to be seen. With the world festering with regional wars, savage terrorists, poison gases, urban crime and nuclear threats by unhinged Iranian and North Korean dictators, college snowflakes apparently view free speech as the globe’s major threat. 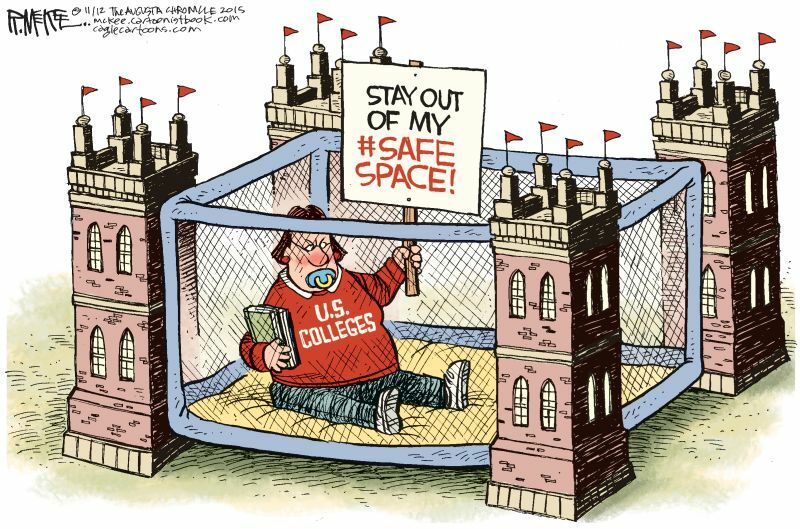 It’s obvious that many of these tax payer funded institutions are out of control and have been taken over by a small group of whacky anarchists while cowed and impotent faculty and administrators look on from “safe places” under their desks. But not all, as many of the ski-mask wearing thugs are faculty members tossing bottles and bricks or instigating this madness forward. Dad and mom may well be the next group to rebel, yanking their addled kids out of institutions that cost $60,000 and more a year while going broke paying these university loons to baby sit junior. According to an article in the Wall Street Journal millions of parents who have taken out loans to pay their kids college fees are being crushed by that debt. As of September 2015, more than 330,000 people, or 11 percent of parent borrowers, had gone at least a year without making payment according to the Government Accountability Office. That exceeds the default rate on U.S. mortgages at the peak of the housing crisis. So while mom and dad are delaying retirement and struggling to pay the mortgage and will probably work until they die, due to junior’s college costs, their kids are smashing the furniture, setting buildings on fire and skipping class to toss rocks at the cops and invited speakers, extracurricular activities that they probably do not want to put on a resume unless they’re applying for positions with Black Lives Matter or the Democratic National Committee. Speaking Of Education: In his latest book “The American Spirit,” author and historian David McCullough writes that the degree of historical ignorance among young people today is astounding and frightening. “Innumerable studies have been made and there’s no denying it”, he says in recounting a conversation he had with a young woman who was astounded to learn that all 13 original colonies were on the East Coast. He writes that he once taught a class at an Ivy League university in which no one could identify George Marshall. One student came close wondering out loud if he had something to do with the Marshall Plan. Today’s college text books are no help he adds, saying that they are “dreary, done by committee, often hilariously politically correct.” McCullough’s book is a slim 176-page collection of 15 speeches given throughout the US between 1889 and 2016 and speech givers range from Teddy Roosevelt and Harry Truman to Chester Arthur and Senator Charles Sumner, among many others. 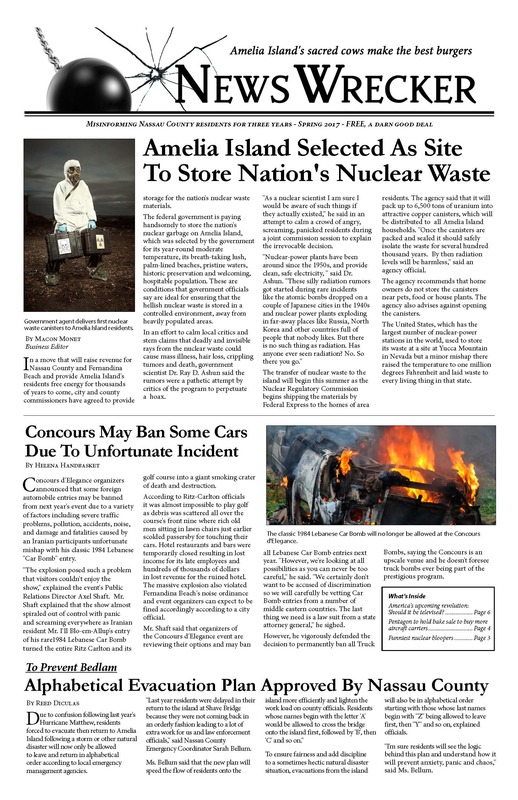 Buy it, it’s a good read. Just Wondering Department: If the American national anthem was played during an anti-Trump rally would all the protestors sit down? Drinking, Dining & Dancing: Tom and Patti Flannery, the new owners at The Surf on Fletcher are obviously giving their creative Manager Joey Ledet the authority to create a menu and set prices that would appeal to locals and tourists alike and Joey has come through with flying colors. Check out The Surf’s new menu at Thesurfonline.com. While dropping off bundles of the News-Wrecker newspapers at various area pubs and restaurants it’s hard not to notice the “Now Hiring” and “Help Wanted” signs posted in these establishments making me wonder if the hospitality industry job pool in these parts is getting a bit shallow particularly with several new bars and restaurants scheduled to open this year including Down Under, Decantery, Lagniappe, Pogo’s, Sadler Ranch, Salt Life, Sandbar & Kitchen, etc. Market demand for good employees will determine the wages paid, not a misguided government mandate to raise the minimum wage to absurd levels, which has caused numerous restaurants around the country to close including 60 in San Francisco since last September, when that left-wing governed city set a $15 hourly rate. “There’s only so much you can charge for tamales,” said the owner of one small eatery there, explaining why he shuttered his business. And the employment problem for hospitality venues locally will only get worse as the labor market is exacerbated by the crackdown on illegals entering the country and the high nationwide demand for the limited number of temporary H-2B visas. However, if you’re a talented bartender or server with a solid reputation this is a great environment. If you’re looking for a bargain, the Karabrew at Karibo, from Monday through Friday, 3 pm to 6 pm, doesn’t get much better as drinks there are one-half off during those hours. Where else can you get a beer for $1.50 or a Grey Goose martini for three bucks? The problem with university administrators letting the thugs and snowflakes run amok, is that they don't want to offend them such that they would drop out. It's all about the money. These days universities are just a business...many of them a BIG business. Total outstanding student loans today are way beyond the total outstanding credit card debt! Dave, Try Captain Stan's Smokehouse in Woodbine. I think it's your kind of place. After dinner there on a Saturday evening, take in the Woodbine Opry and bring your dancing shoes. It's free and a fun place. As usual Dave, your observations are 'dead on' especially about Texas brisket. My wife and I went to Willie Jewell's tonight, ordered the brisket, and told Tessie Manning the manager about your blog. She was thrilled to read it. The meat was delicious but the sauces were lacking. I told her about Rudy's BBQ in San Antonio where I get my sauce and also mentioned to lay out some pickles, onions, and jalapenos. We moved here from Houston and missed the brisket and Tex Mex. Now at least we can get brisket (I'll be taking my Rudy's with me next visit). P.S. Donnie Lawrence, you're exactly right about trying to buy a brisket here... they leave zero fat. There's probably as many restaurants attempting to imitate Texas BBQ as there are those who unsuccessfully stake a claim to NY pizza. Even in New York City there must be three or four "correct" recipes. Dave -- As usual your latest News-Wrecker is hilarious. Thank for sharing it on-line but I have one question: why were you never this funny when you worked for me at IBM many years ago? George, the job description you wrote for me said "don't be funny", you left that chore up to Bill Shaffer, who may be the most humorous man I've ever met. Also, IBM --- while a fine company-- was not exactly a funny place to work. I like a big NY deli Pastrami on Rye (with deli mustard) and a Miami pressed Cuban Sandwich (it's the pickles). Happily, New Yorkers have no clue about grits. The day you can buy your fav regional food anywhere in the U.S. is the day somebody does a big IPO and opens up a 1,000 restaurant chain with a cute logo. Count your blessings. One of the reasons is the Texan's use of mesquite wood in the smoking process of the brisket. The other reason is the same as why when I'm eating breakfast in Texas I can't get good cheese grits like I can here in the South. Totally agree Dave. Way prefer brisket to ribs! Thanks for the plug Dave! You forgot to mention the great conversations with bartenders at Karibo! 😂See you soon! Dave. You need to visit any BBQ Contest sanctioned by the FL BBQ Assoc. or the Kansas City BBQ Society and try brisket smoked by Pitmasters that have perfected their craft. Their brisket is just as good as any Texas brisket and probably not as fatty. Try It!